My Tried and Tested: And what do you do? Today actor Tim West revealed that his wife, Fawlty Towers star Prunella Scales, has 'a sort of mild Alzheimer's'. I know this isn’t a fun topic. But I have a little first-hand experience of what living with someone with dementia is like. My father-in-law, a clever, perceptive man, developed dementia towards the end of his life. And although we could laugh about his little ways – humming to himself when he couldn’t follow the conversation round the dinner table or asking the same questions in a tone of polite enquiry over and over again – it can’t have been easy for his wife who cared for him day in, day out. I was recently sent a book written to help families cope with Alzheimer’s or other dementias. It’s full of useful, easy to understand advice and I could have done with it when my father-in-law was still alive. It spells out how to managing the sort of challenging behaviours that may present themselves - such as agitation and confusion, hiding things or refusing to wash. The advice is often simple but is drawn from decades of caregiving experience by experts. So although I haven't personally tried and tested these techniques, others have. *Avoid patterned dishes, placemats and tablecloths. Patterns can be confusing as vision worsens or distracting when you need Mum to eat. *Look to create contrast on the dinner plate. Mum may not be able to see turkey, potaties and cauliflower on a white plate. Consider a coloured plate. *Enter her reality. If Mum believes she is a young mother with toddlers, go along with her reality in a non-commital way by discussing how toddlers can be difficult. Redirect Mum to a favourite activity such as naking a cake. 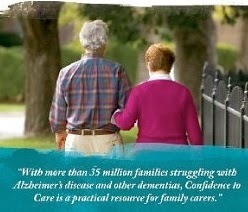 Confidence to Care by Molly Carpenter (Homestead Press) is available through Amazon rrp £7.99.